When you’re working on marketing, it’s vital to get a second opinion. And a third opinion. Maybe a fourth, too. The point is – you should listen to other people, within and outside of your industry, to make sure you’re covering all bases in your strategy. 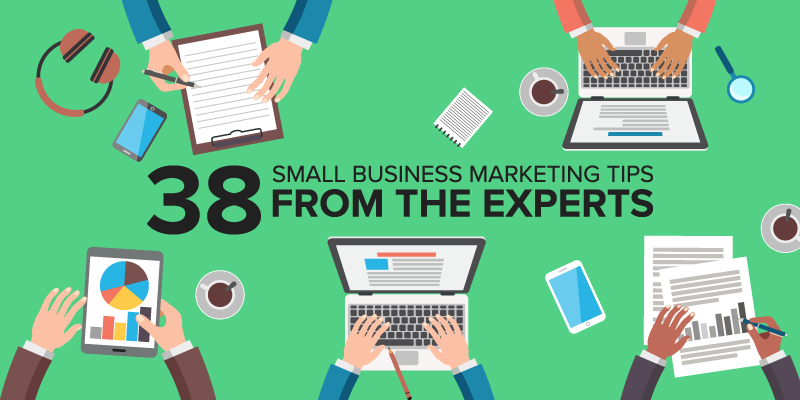 Especially when it comes to small businesses, it can be difficult and even a little bit intimidating to reach out to experts and get some advice. That’s why we put together this monster list of awesome tips from the marketing experts – just for you! “For all of our own brands, and our clients, our number one most effective tip is a gorilla marketing strategy called “newsjacking.” This works by injecting a product, service or cause into a breaking news story in real-time, leveraging the news to gain credibility, customers and influence. Love him or hate him, this is the same strategy Donald Trump used to generate $2B worth of free publicity and exposure to win the White House. “Everybody knows the host of a networking event, or at least knows their name. Put yourself in the spotlight by being the host of a local networking event and invite your clients, business partners, and any companies in your industry with the same target customer. There are many benefits to hosting an event, both big and small, in your community. If you set up a series of events or workshops with others in your industry, you have automatically positioned your company as a thought leader and people will begin to look to you for advice and guidance. “While many small businesses owners know that SEO is important, we find that many do not fully understand the benefits of targeting specific keywords. Sure you want to rank for the big keywords in your industry, but a lot of the time this means competing with companies that have thousands and thousands of dollars to spend on SEO. In comes the long-tail keyword. By targeting terms through web pages and blog posts that target long-tail keywords with lower search volume, you are able to rank for industry specific terms that yield targeted traffic. For example if you sell siding or windows, instead of trying to rank for “siding repair” look for terms like “how to know it is time to replace siding” or “best window treatments for (your regional weather)”. These long-tail keywords do not have as much competition and an editorial piece on the topic should be relatively easy to rank for. Companies can then put a call-to-action on the page or post that ranks for this term and capture potential leads. “Shock and awe is a guerrilla marketing tactic that works for almost any industry and any field – but is especially effective for fields that are service-based, such as finance, law and medicine. Here’s what you do: Isolate 15-20 industry influencers. Then, send them something in the mail or via email that they would NEVER expect to receive. The point is to create buzz, not necessarily value. The more they talk about you, the more attention you will get in the market. For example, we created a special report for financial advisors called “”The 5 Threats to Your Financial Freedom”” that played on gun control and terrorism but gave serious advice on getting ahead of the game financially. Some thought it was controversial, but that is exactly the point. It got people talking. Also, the graphics and content were high-quality enough to show that we meant business either way. We have used this tactic with stuffed animals of celebrities, jokes about competitors and even mini-iPads that play a video as soon as the recipient opens the package (Think Jeb Bush’s political campaign). The same technique is incredibly effective for referral marketing as well. For Groundhog Day, for example, we sent our doctors’ client lists a stuffed groundhog and a reminder why its important not to keep your head buried in the sand but to keep looking forward towards that next healthy year or decade. ““It’s all in the list” I like to tell clients “everything grows from there.” Start by building a list get the basics; name, email address and phone number from clients who you have done business with as these are people who already know and trust you and who you are likely to market future products/services to in hopes they will buy/promote/recommend you. Once given the basics you can market products/services, send offers to them via text messages and email. “Not all products are well suited for mainline digital marketing through pure social, inbound and AdWords. Many products are best sold when a real human gets to interact in a long format with the prospect – for instance in a meeting, webinar, web-conference or phone call. All too many times, the salesperson or marketer makes the first call and tries to sell the product. For best results, sell the meeting (or elongated phone call or web conference); then when you get the prospect to the meeting, you’ll have plenty of time to sell the product. “Just because you started a business and you have a website, does not mean that people will find you. Too many business owners will build their business, but will not leave anything in the budget for promotion. And if there is something in the budget for promotion, it’s usually for the wrong marketing tactics for that particular business. “My best marketing tip is to automate as much as you possibly can. Marketing automation was created to help businesses scale relevant, worthwhile digital engagement for a large population of potential customers. No one has the time to send highly targeted emails to thousands of people at a time. Use the tools you’ve invested in already to help you configure that process in the most efficient way possible. Based on which automation platform you select, you will have a variety of customizable tools and workflows that will work around your specific instructions. “What this means is that too may SMBs try and be everything to everybody. They want people to know that they sell this, and this, and this. But people don’t remember a catalogue. They remember one thing if you’re lucky. So chose one message only to market, and keep pushing that one message. “In Twitter, use ? in search to find questions people ask that are relevant to your business. For example, you’re in enterprise content management. In the Twitter search box, enter: ? “”enterprise content management”” to pull up potential questions your team can answer. The more helpful you are without being self-serving, the more you get noticed. It can lead to people visiting your website and new subscribers, or whatever call to action you have on your website. #17 – Commit to Giving Away 1,000 Ideas Per Year. Record something that is of value to someone you want to connect with. It could be something they could improve on their website, or a new app or tool you have discovered. Ensure the video is short and sweet and personalized – the audio should address their name and how this video can specifically help them out with something. Email them a private link to the video. Don’t ask for anything in return. Just let them know that your payoff is good karma. “Basic human psychology dictates that people want what they can’t have. So if you’re planning on launching a new product or service consider creating an ‘exclusive waiting list’ that people join. Use anticipation and intrigue to drive people to your website ready to sign up, register their interest, or get in touch for more info. “There has never been a better advertising medium for small businesses than Facebook. With Facebook, a local SMB can geo-target its immediate trading area which is often just a 3-5 mile radius from its business. More important, it can target people that live in that radius or it can target visitors to that area. A restaurant, for example, might be more interested in reaching visitors than residents. Even better, Facebook gives you a wealth of interest targeting data so you can reach only those people in the geo area with particular interests that are important to your business. “SMBs shouldn’t let email automation scare them. Yes, there are big systems and really complex automations that can be created – and that comes with a cost. But less expensive platforms exist with a surprising amount of easy-to-use functionality (like MailChimp). “Create a blog on your website and keep it updated. Content Marketing is a brilliant and low-cost way of increasing your website’s authority. Blogs are perfect targets for link-earning; creating posts which are engaging to your target audience and other publications will make them want to link to your website, which will increase your site’s domain authority and push it further up the rankings in the search engine. “Let’s talk Social! Purely because; it is one of the most important marketing channels of 2017. One of the biggest mistakes small businesses make is too much self-promotion. The whole point of Social Media is to help people and engage…So, 80%-90% of your content should be focused on exactly that! Sell directly and you will turn everyone off. “Providing comment from your business’ spokesperson to journalists seeking detail for their articles is a great way to secure coverage and position your brand as an authority on a topic. Finding these opportunities can be tricky, however, especially if you don’t have the budget for media monitoring and journalist request tools. Use Hootsuite to monitor the daily news and to spot any relevant journalist requests that are crying out for comment on a particular topic, it could be one that your business specialises in! “People aren’t going to buy your products if they don’t know who you are. The sales process leads with selling yourself before you are able to sell your company. If you want to have a small business that thrives, you need to build trust with your audience and they need to buy into you. If they buy into you, then they will be more interested in buy your products. The only way to achieve this is by building a strong and powerful personal brand. “Never get obsessed with the latest shiny thing or jump into digital marketing tactics without thinking it through. It can be so easy to come across the wise words of some influencer that’s talking about the latest thing in content marketing or SEO or social media. It can be exciting to try new things but you are not always going to get the return you need. As a small business money, resources and time are tight. You have to squeeze every last drop of juice from the lemon. And the influencers that are covering 10x content or other similar (potential) fad don’t know your business. They don’t know your niche. They don’t know you market. They don’t know your customers. They don’t know your landscape. The majority of SMB industries are seeing an increase in competition – even in local markets. The first page of Google is getting more and more competitive, and word of mouth is becoming less credible. At the same time, we’re seeing consumers becoming obsessed with finding the absolute best products and services. Enter: reviews. 85% of consumers trust online reviews as much as personal recommendations. Now is the time to begin acquiring reviews and setting yourself apart from competition. Having said that, consumers in 2018 aren’t just looking for 5 stars, they’re looking for details. What made the experience great? Who on the staff did they work with? I would argue 5 detailed and authentic reviews beat out 10 reviews with little to no detail any day.